These are some of the examples of emotions oozing out from the users when they use a mobile app and surprisingly these emotions can be categorized into two points, satisfied and dissatisfied, and no prize for guessing, more your users are satisfied, more are the chances for attaining huge popularity for your mobile app. But the question comes, that how to achieve the customer satisfaction for a mobile app platform, where it is a cut-throat competition and the survival rate of the app is quite tough. Indeed the phrase,’ I am not satisfied with this app’s performance or features,’ are the horrific words, and one never expects to hear them out from the app users. Customer satisfaction is not just a process, but it leads to a new window through which your targeted audience can peep into a different world of services but only at their convenience. Mobile app technology indeed has brought a revolution and every possible industry and the business domain has adapted the app technology to bring the world closer to an axis point where every service is just accessible through a tap on the Smartphone. But something more concerning too has arisen from this condition, and that states that unless you offer a satisfactory app experience to the users, your users would never prefer to utilize your mobile app, no matter what features and functionalities it has to offer, thus if you want to win the customer satisfaction, you need to integrate a number of factors in the app so the app users can experience the seamless user experience. When you decide to develop a mobile app, there are many functionalities and the features, which you plan to include in the app as you want your app to be a perfect answer for all the required services, but you would be shocked to know that even by integrating all types of features, you cannot achieve the customer satisfaction, since the integrated features are a part of your expectation from the app, not from the users. So the proven methodology suggests that you need to be a good and attentive listener to your users’ demands and do exactly what they want and expect from your app. The biggest turn-off for a mobile app comes when your users are unable to find the answer to their questions and they don’t find your customer support effective enough which creates a void between you and your app users since there is no valid communication bridge. Your app users prefer when they can access you with an ease in the event of the issue faced, so integrate the in-app chat support feature so your app users can reach you anytime. This would build trust and your app users would be satisfied to know that somebody is there to listen to their pathos. Many business owners and the marketers feel that a mobile app development process is finished the app is launched, but they forget that the real journey or the acid test for the mobile app begins when the mobile app is launched, because now mobile app goes through a series of challenges and the feedback from the real-time users. Another strategy to attain customer satisfaction is by offering the prompt response to the users’ feedback and opinions. There would be many incidents, where one user might not agree with certain features or might face the problem in accessing the app’s features, so if you want to make sure that your app is liked by the users, then you need to ensure that you offer the prompt reply to every feedback or the opinion given by the users. And in the case of genuine issue, update your users as well, once the issue is resolved, this will help your app to gain the trust of the users and they will find you easy to be approached. Your users would be delighted if you allow the personalized experience to pave a way for the mobile app. When you send the notification for any offer, try to address the user with their name, and try to offer them the ongoing or any festive offer to grab more attention. Also, you need to take care of not feeding excessively your users with the notifications and the messages, but it should be in moderation. Try to integrate the on/off button for the notifications, so the users can happily access your services not the forcefully. When an app is developed, it goes through a series of transformations in order to achieve that perfect result which falls fit for the users, but this process must not be curbed once the app goes live, rather the app must be always in the evolving process to serve users with the best services. Keep a closer look on your users, what are they enjoying and what they spend less time on, trach your competitors, if you find any particular feature or the functionality which can be added or removed further to attain a successful app, then you should not stop or be rigid. 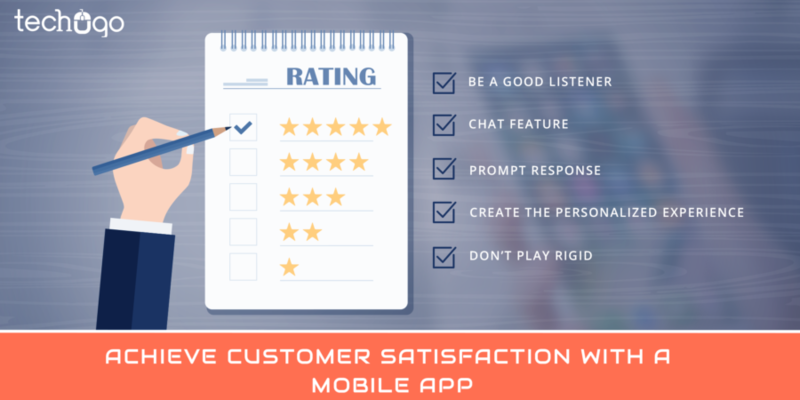 Customer satisfaction only comes when you offer the services which are the translation of your users’ actual requirements, so you need to hire a top mobile app development company in India– Techugo, which has the years of experience and the technical exposure to craft your mobile app in a way that it can win the hearts of users and build strong customer satisfaction wall around your mobile app.